Bombay Fashion Week was held on Sunday, 10th September 2017 and of course, we are here to give you the inside scoop on the latest bridal fashion showcased at the event. 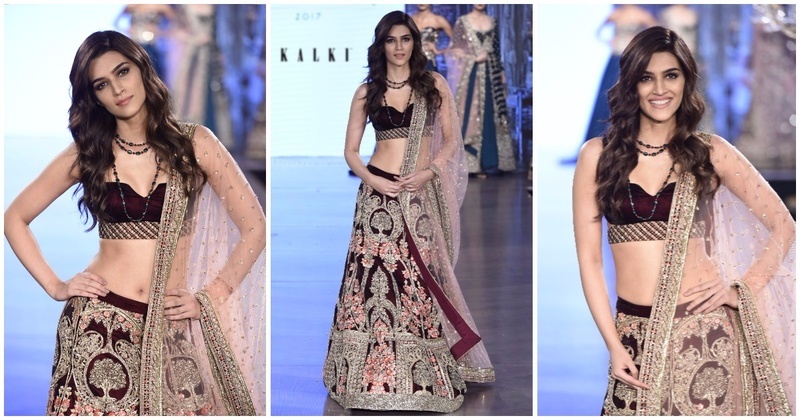 Kalki, one of Mumbai’s leading bridal fashion stores unveiled their new collection ‘Mirabell’ at the event, with Kriti Sanon playing showstopper. Kriti opted for a lehenga inspired by the magnificent Mirabell palace gardens that speaks a design language that is unique and timeless. The ensemble in deep burgundy adorned with floral embroidery in a chequered pattern gave out a vibe of a royal empress. “I am immensely impressed with the designs that have the fusion of vintage and ethnic styles. The amalgamation of floral threadwork with geometric motifs weaved together is what sets ‘Mirabell’ apart from the rest!” - Kriti Sanon. This collection is inspired by the archives at the royal palace gardens, the florals, leaflets and foliate along with the birds’ motifs that evoke a sense of elegance and panache is the highlight of this collection. Using silk velvets, duppions and satins along with shear nets and organzas, the outfits from KALKI’s signature collection are lovingly crafted to last generations. The stunning range was brought alive in shades of millennial pink, pale blue, royal blue, rich red, burgundy and deep wine shades. Driven by the weaves of traditional; European artistry, Mirabell Collection renders statement ensembles instilled with royalty, feminine elegance and urbanity giving it a luxurious feel. Loved the collection? Shop them here! Check out what Kriti has to say!